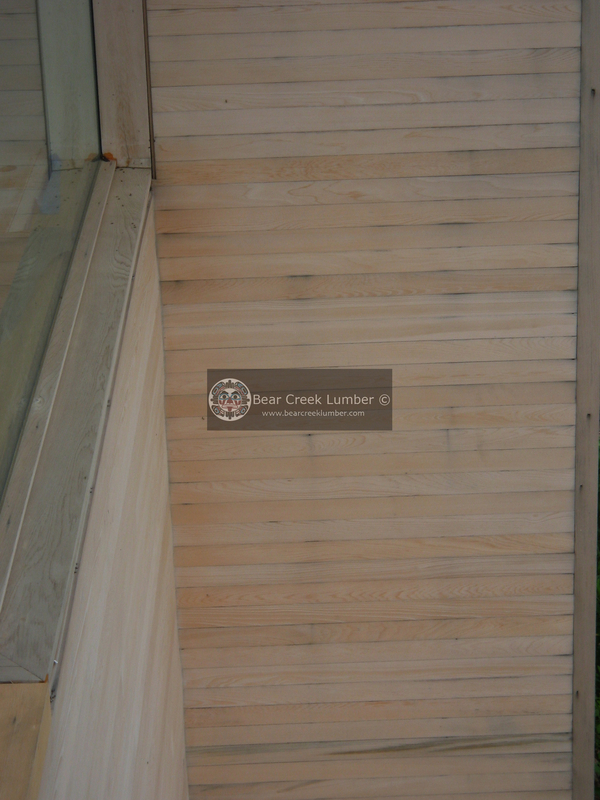 Bear Creek Lumber is also offering some of our brochures online. In addition we are offering technical information in PDF format, and HTML format. Click here for our online literature. Improper handling of your lumber products can cost you time and money. By properly handling your lumber when it arrives, you can protect its appearance, and control the product's moisture content. Rapid or uneven moisture change can result in warping, staining and eventual shrinkage. Wood either absorbs or loses moisture content depending on the difference between its moisture content and the moisture content of the surrounding air. Air temperatures also play a role. Hot, humid air causes wood to quickly absorb moisture. When lumber dries, it moves moisture from the interior to the surface of the wood. The reverse happens for absorption as moisture travels from the wet exterior to the drier interior. Lumber shrinks and swells according to the transfer of moisture in and out of it. Most problems occur when this process happens too quickly or unevenly. Lumber should never be stored on the ground. It should always be covered with lumber wrap. 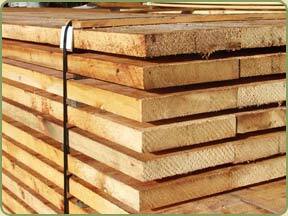 Always keep lumber on dunnage so that air can circulate under the pile. Avoid moving lumber when it is raining. Interior products such as paneling should be stored inside, and allowed to acclimatize. Never store lumber in a room with fresh concrete or drywall. Let the wood product acclimatize for at least one week before application. Ideally you should sticker (shown to the right) the wood in the room it will be installed in. It has been determined that non-corrosive stainless steel nails are the best for exterior use or for high moisture interior uses. Bear Creek Lumber recommends these types of fasteners. 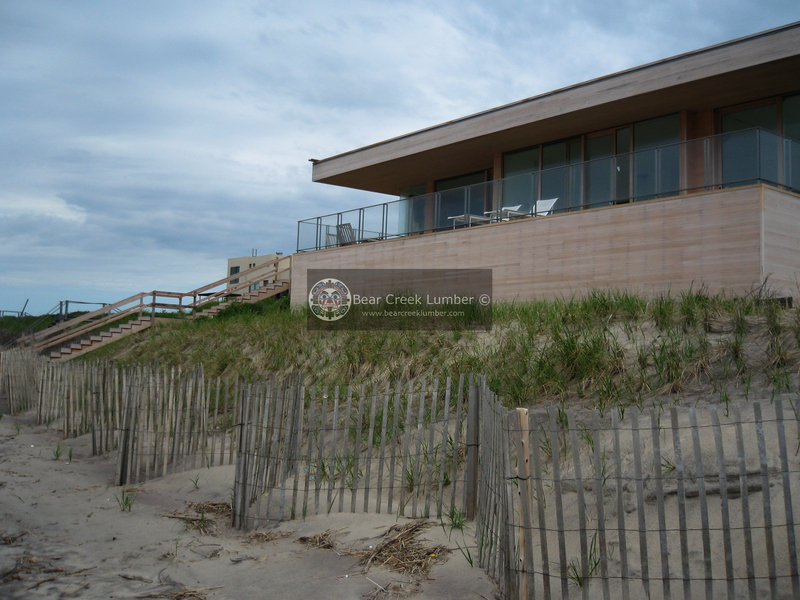 Below: images of a project were Alaskan Yellow cedar was used as siding. The contractor installed the tongue and groove siding with regular nails. Even though it's blind nailed, the siding shows black corrosion streaks throughout. Priming or pre-finishing is recommended by the wood products industry. This is because pre-finished lumber is less likely to shrink or swell after it has been nailed up. Be sure that the pre-finish is compatible with the final coat before application. For example, clear water repellents should not be used if a bleaching finish is planned for the final coat. 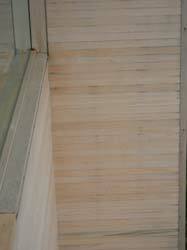 Use building paper under all types of natural wood siding. Building paper is a water barrier rather than a moisture vapor barrier. It is recommended to prevent water from entering the wall cavity. An appropriate vapor barrier should be used on the warm side of the insulation to reduce moisture movement from inside. Never build with wet building paper or siding products. Allow everything to dry before application. Preparation is the key to achieving an attractive and long lasting finish. Dry and clean all surfaces, and protect against potential moisture problems. Each type of wood product responds differently, so for best results consult your local paint and stain distributor for more complete information about the product you are interested in. See our online brochures for finishing. While most of the same finish application can be used for both interior or exterior lumber products, it is very important that you remember that seasoning (through drying) and pre-finishing of paneling is of utmost importance. While cedar and redwood do not necessarily need to be finished ( because of their natural resistance to decay and insects), some sort of sealing agent is recommended for future ease of cleaning. On new construction, any drywall work should be dry before bringing in the lumber. Being subject to moisture penetration, masonry and concrete walls should be waterproofed before the application of wood paneling. Stain: Semitransparent and heavy bodied stains are easy to apply, inexpensive and available in a wide range of colors. The woods natural texture and grain are enhanced by semitransparent applications. Use heavier bodied stain when grain and characteristic markings are not visually desired. Paint: Always pre-finish wood before using paint. Some species have a tendency to bleed through paint because of their resinous nature. Pre-finishing will prevent this. Blister resistant paint is recommended. 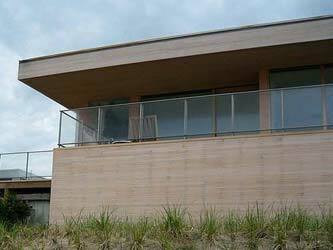 Bleaches: When using Western Red Cedar, a "natural weathered look" can be achieved with the application of a bleaching agent. Generally one coat will be sufficient. The color change in the wood is permanent. Water repellents: Two applications prior to nailing are recommended. A third coat should be applied after the siding or deck is finished.